Interpol's Environmental Crime Programme has announced the launch of Project Scale, a worldwide effort to stem illegal fishing. The initiative will help build a systematic approach to ending the extensive problems caused by fisheries crime. Illegal fishing inspector on patrolToday, Interpol�s Environmental Crime Programme, with support from The Pew Charitable Trusts, the Norwegian Ministry of Foreign Affairs and the Norwegian Agency for Development Cooperation, announced the launch of a major global effort to stem illegal fishing and its associated crimes. This initiative, called Project SCALE, was launched at the 1st INTERPOL International Fisheries Enforcement Conference held at the Interpol General Secretariat in Lyon, France. Illegal, unregulated and unreported fishing costs the global economy up to $23 billion a year, according to a landmark study published in 2009 in the peer-reviewed journal PLoS One, and harms coastal communities, legal commercial fishing interests and the marine environment. Illegal fishers exploit � and profit from � weak laws, poor information sharing across jurisdictions and a shortage of monitoring and enforcement resources, particularly in developing countries. 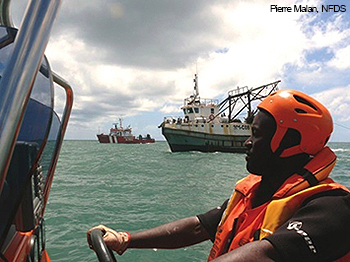 Gathering better data on fisheries crimes to help improve monitoring and enforcement. With Pew and the Norwegian government�s support, Interpol will conduct targeted monitoring and enforcement operations with a focus on vulnerable regions, including West and Southeast Africa. Working through its member countries� National Central Bureau, Interpol will strengthen marine enforcement expertise and, ultimately, improve fisheries compliance and enforcement worldwide. The global police organization has also developed a Fisheries Crime Working Group, which will hold its first meeting this week in Lyon. Pew has been working since 2009 to build a more systematic approach to end illegal fishing globally. Reaching that goal will require better identification and tracking of fishing vessels; inspections of vessels in port; information sharing among countries; the deployment of advanced technologies; the engagement of the policing community; and the investigation and prosecution of alleged fisheries crimes. Interpol is the world�s largest international police organization, with 190 member countries. INTERPOL facilitates cross-border police cooperation, and supports all organizations whose mission it is to prevent or combat international crime. The Interpol Environmental Crime Programme assists member countries in enforcing national and international environmental laws and treaties. Interpol strives to contribute to the ongoing conservation and, regarding fishing, sustainable use of the world�s environment, biodiversity and natural resources. For more information on Interpol�s Project SCALE, please visit the Environmental Crime Programme�s Web site. Good. I hope this helps. I would like to see commercial fishing curbed even more. Though illegal fishing is a problem, but so too is legal fishing. The oceans are not infinite in their ability to turn out food, and if things keep as they are, sharks and whales may soon become the next extinct species. I agree Kit--only I'm thinking even more of the Atlantic Coast of US issues where there is movement towards loosening rules that aren't tight enough to sustain fish populations and the Mediterranean Sea. You cannot currently send a star to Kit because you have done so within the last day. Thanks for posting the video link Terry! Wonderful news J.L. on several fronts. Not only will illegal fishing be regulated, it opens many employment opportunities for several highly trained military personnel to find jobs all over the world, when they exit which ever military organization they belonged to. Hopefully the oceans and most that live in and on them will be protected by professionals. Then, there may be the other side of wonderful. New wars are coming (are here), and the new " Enemies" are those who over exploit resources (large, medium and small conglomerates/individuals) of all survival necessities clean (air, food, water), everywhere on this planet. Then, from an opposite view (large business conglomerates & etc.,), the "Enemies" may be those who Don't want to exploit (me as an example) the earths remaining resources for an unneeded profit.. Well, guess I should be afraid. I can't pay the military trained to watch the earths backside (survival), like the financiers of the exploitation (eat until every last bite is gone) world can. Sounds good to me, engenders some glimmer of hope. You cannot currently send a star to Mitchell because you have done so within the last day. A very welcome and long overdue step! Thx! But it will also create some problems I imagine. This illegal fishing is probably not practised by small groups or individuals only, but rather on a large scale by big companies as well who will certainly fight back. You are welcome Angelika. It is indeed! You cannot currently send a star to Angelika because you have done so within the last day. Thanks J.L. for the post. Great news and about time. Kudos to Interpol for launching the initiative. Read and noted. You are welcome John. I agree. You cannot currently send a star to John because you have done so within the last day. Wonderful news ---hope it works out! You are welcome Zee, DD, Magdika, Robert, Frans and Tanya.